Andrew here. If you saw my “Preface” post, you know a couple of things about me already — I love “bad” weather, and I like to find gear that lets me go out and take photos in that weather. I took my Kahtoola Microspikes with me to Iceland and they not only worked perfectly, I’d never go to Iceland in the winter without them. They were crucial for getting around since most trails and paths, especially around waterfalls, were frozen over. Sliding around in boots is slow, dangerous, and just unpleasant. The spikes gave us a freedom of movement and a level of safety that made the trip much more enjoyable and productive. After my great experience, I figured they were worth a writeup. 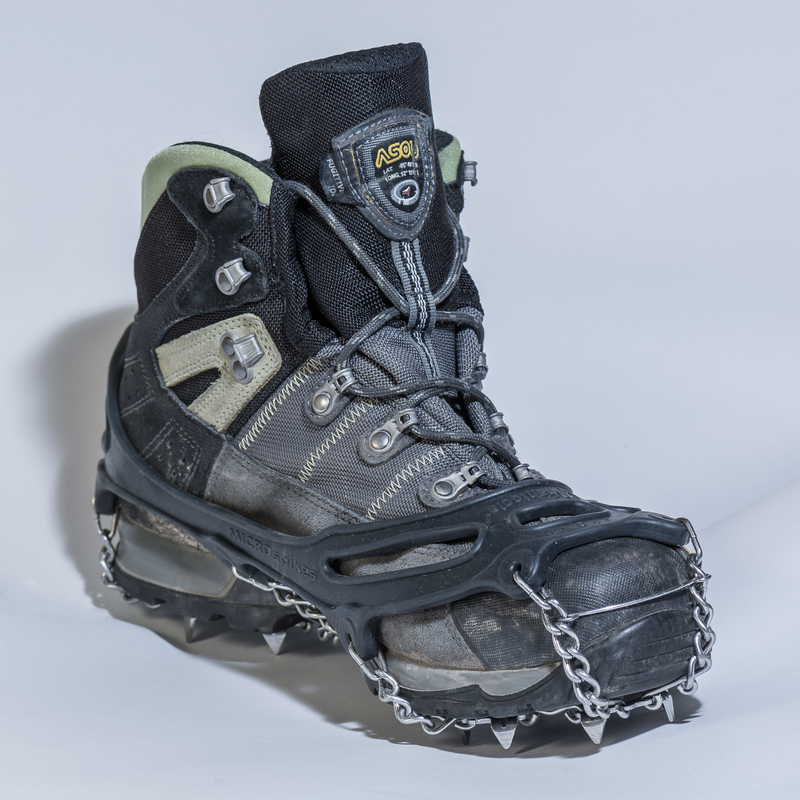 For most people, most of the time, crampons are overkill. They’re also a pain to use. On the other end of the spectrum, my limited experience with Yaktrax was that they weren’t very durable and were best suited for walking the dog on icy sidewalks. What happens when Crampons and Yaktrax meet in the middle? Kahtoola’s Microspikes. And the result is awesome. The Microspikes have twelve ⅜” spikes on each foot, chained together and attached to your boot with a heavy duty rubber strap. The strap is allegedly flexible to something like -70 degrees F. That’s way beyond where I stop being flexible. These are pretty much the perfect hybrid of real grip and convenience. Overall, these are extremely durable, comfortable, and convenient. When walking with them, you eventually forget you’re even wearing them. You can just walk on ice like it’s pavement. (For science, I even went for a brief jog on a solid sheet of ice. No problems.) The spikes are short enough and the whole system is durable enough that you can cross mixed terrain without having to take them off. Most of our Iceland hikes involved interspersed icy and rocky areas and it was good that we didn’t have to take the spikes off every 200 meters. I’m sure heavy use on rocky surfaces will dull the spikes, but I’d bet you can sharpen them again. Even with the amount of hiking we did, I didn’t notice any wear on the points. One concern I had was that they’d be great on ice, but slippery rocks would be a problem if the metal didn’t grip (back to my original use for these, walking in mostly frozen streams). A few tests (without the camera gear in hand) proved my fears were unfounded. They’re awesome for slimy wet rocks too. This was Day 1 and an early win for the Microspikes which let me easily walk the frozen trail and up the frozen stream to get to this incredible spot. So, what’s the catch? Just like normal crampons, you can potentially step in a way where they don’t grip. The sides and back obviously don’t have spikes, so if you get too complacent in uneven terrain and forget you’re relying on spikes for traction, you could find yourself without grip. If you’re even mildly attentive to what you’re doing, you’ll be fine… but because they’re so comfortable and easy to get used to, complacency isn’t an unfounded concern. Walking on ice on metal spikes also makes a fair amount of noise, so if you’re planning to sneak up on wildlife, I’d either get there well ahead of time or stick to the kind being eaten by vultures. Finally, they’re not cheap. At somewhere near $65, you’re going to consider how much you’ll use them, but if you’re traveling or hiking with camera gear in the winter, it’s probably a very good investment. 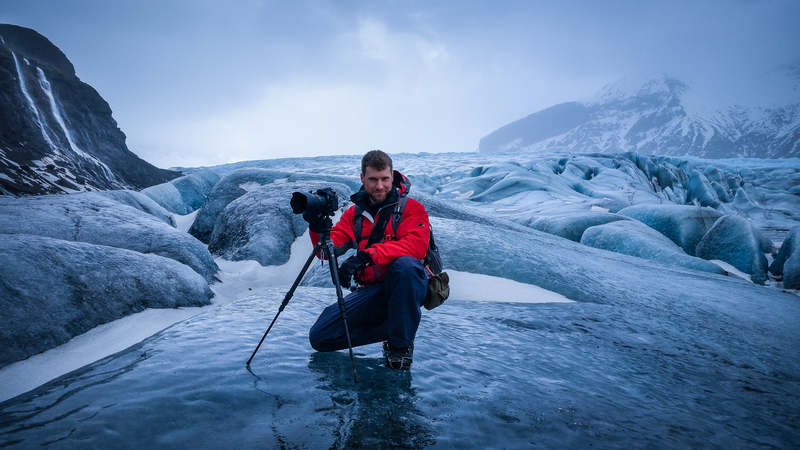 As an aside, check out FStoppers’ awesome video series with Elia Locardi in which they discover they probably should have gotten themselves a few pairs of these before their trip to Iceland. You can see one such instance here where the icy terrain stopped them from getting the composition they planned, but I’d definitely recommend checking out the whole video series. Andrew here. I’m rarely somewhere scenic for long. I’d say 99 times out of 100, I’m in front of something photographically compelling once, either as an intentional destination, or stopping while in transit to somewhere else. If I’m going there on purpose, I *try* to time it for good conditions — the right light, the right time of year, the right weather… and so on — but that’s not always an option. That’s even less likely when I happen upon something interesting. So, on those rare occasions when I will be spending time at or around something with good photographic potential, I really try to make the most of it. In this case, I spent most of a week at the Grand Hotel Baglioni in Florence, Italy. I was there for work, so I couldn’t really focus on photography but because I was there for a week, I did have many chances to check out the incredible view of Florence from the rooftop. I saw it in the morning, I saw it at night (no tripod… alas! ), I saw it in the rain, and I saw it at sunset. In this case, I saw it in the rain at sunset, and when I saw the side light start poking through the clouds, I grabbed the camera and headed for the roof. I didn’t stay for long (thunder plus rooftop shooting = bad idea), but I managed to come away with a few shots, including this one.